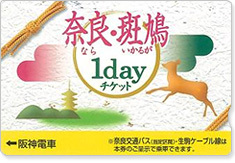 Nara & Ikaruga One-Day Ticket Hanshin Ver. A convenient and good-value ticket for traveling between Kobe and Kansai International Airport. 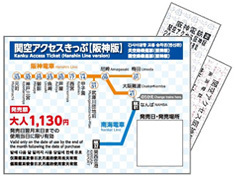 * This ticket is for interline connections between the Hanshin Electric Railway Lines and Nankai Line only. It may be used one (1) time for one-way travel between any station on the Hanshin Electric Railway Lines (excluding the Kobe Kosoku Line) → Hanshin Osaka Namba Station … (Change trains) … Nankai Namba Station → Nankai Kansai Airport Station. * This ticket is collected by the station staff if you get off and exit at any station other than Hanshin Osaka Namba Station or Nankai Namba Station. * A separate fare is required for riding outside of the valid route. * An additional charge is required for limited express trains with reserved seating of Nankai Line. 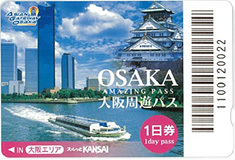 For one-day sightseeing to fully enjoy Osaka, the Osaka Unlimited Pass offers a substantial price advantage! With this all-you-can-ride pass, you have an opportunity to freely tour around and have fun in Osaka! This pass offers free or discount admission to popular facilities and various benefits at shops and restaurants!! * Refunds are acceped during the valid period at the window where you purchased the ticket only when the ticket is unused (handling charge required). The stationmaster's offices of Umeda, Amagasaki, Koshien, Mikage and Kobe-Sannomiya Stations as well as each station (except Osaka-Namba, Higashi-Naruo, Suzaki and Mukogawadanchi-Mae stations) except during the absence of station clerks. * Refunds are accepted during the Valid Period at the window where you purchased the ticket only when the ticket is unused (handling charge required). Tickets convenient for tours around historic sites with coupons for temples, shrines and tourist facilities! The stationmaster's offices of Umeda, Amagasaki, Koshien, Mikage and Kobe-Sannomiya Stations as well as each station (except Osaka Namba, Higashi-Naruo, Suzaki and Mukogawadanchi-Mae stations) except during the absence of station clerks. 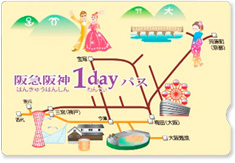 * This one-day ticket includes coupons tickets for discounts or privileges for shrines, temples and facilities.